I wonder how the Wisconsin population who tripled-down on Scott Walker felt reading this article? ■ Poverty went up significantly in 31 of 72 Wisconsin counties, including 11 of the 15 most populous counties, during the most recent five-year span. Estimates show about 738,000 Wisconsin residents were living in poverty during the 2010-'14 period, compared to 605,000 in the 2005-'09 time frame. ■ Nearly one in five Wisconsin children was living in poverty during the 2010-'14 time frame — 239,000 children in all, or 18.5% of all children. That's up dramatically from 14.6% in 2005-'09, and represents another 50,000 children. Only 10 states had faster rates of increase in child poverty than Wisconsin. 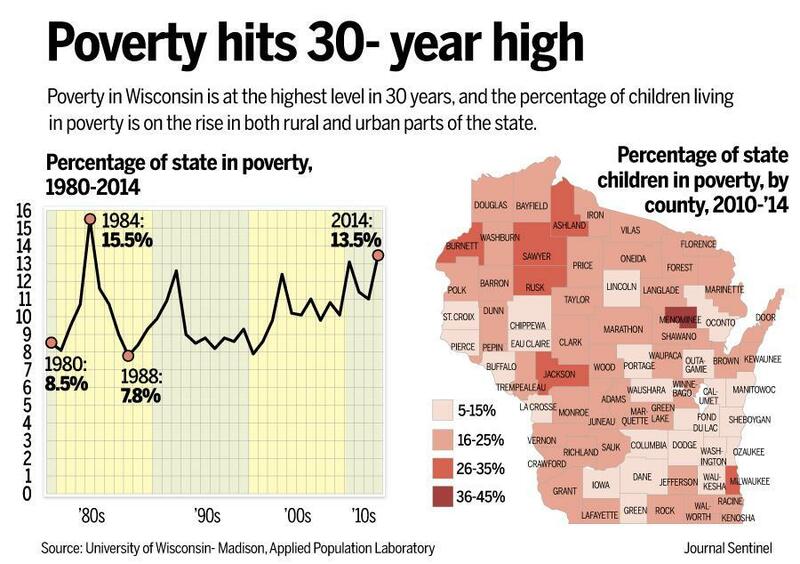 ■ Twenty-five of Wisconsin's 72 counties had a significant increase in child poverty. No county had a significant decrease. The highest childhood poverty county remains Menominee, which went up from 35.1% to 44.8% of residents under age 18 living in poverty. Milwaukee County, the state's largest urban center, went from 26.4% to 33% child poverty and is now tied for second highest with Sawyer County in northern Wisconsin, where Hayward is located. Other Wisconsin counties with child poverty rates above the national average (21.9%) for 2010-'14 included: Kenosha, Rock, Vilas, Forest, Adams, Clark, Vernon, Monroe, Burnett, Ashland, Rusk and Jackson. ■ Racial disparities in poverty are bigger here than in the U.S. as a whole, and are growing faster. The poverty gap between African-Americans and whites grew 4 percentage points in Wisconsin, while the national average did not grow, Jones said. Wisconsin's poverty rate was 39% for blacks and 28% for Latinos, compared with 11% for whites — significantly wider gaps than in the rest of the country. Nationally, the analysis reported the gap between blacks and whites was 16 percentage points, and for Latinos and whites, 13 percentage points. ■ Significant changes in poverty occurred among adults at every level of educational achievement in Wisconsin. For those with less than a high school education, poverty rose from 20.5% to 24.5%. The impact was mitigated by a decrease in total population with low educational attainment, which dropped from 380,000 to 337,000. For those with a high school education, poverty rose from 8.9% to 11%. It increased from 6.6% to 8.9% among those with some college. Poverty also touched those with bachelor's degrees or more, rising from 3% in 2005-'09 to 3.6% in 2010-'14. ■ Poverty cut across various levels of employment in Wisconsin. Among the unemployed, poverty increased from 27% to 31.6%. The number of unemployed adults grew by about 35,000 people between the five-year periods ending in 2009 and 2014. Increases were also seen among the working poor. Among employed adults, poverty rose from 6% to 7%. It increased among those employed full-time from 2% to 2.4%. UW-Madison's Applied Population Lab is housed in the Department of Community and Environmental Sociology in the College of Agricultural and Life Sciences. UW-Madison's Institute for Research on Poverty each year produces a single-year census data comparison called the Wisconsin Poverty Report. That report is due later this spring.